Periscope is 4 years old today. That is a lifetime in livestreaming years. I have gotten on Periscope way back in July 2015, left in 2017 and returned in December 2018. Since then there has been Facebook Live, Instagram Live and YouTube Live entering the picture. However, good ole’ faithful Periscope (It has yet to go down like Facebook and Instagram had earlier this month), is still up, running and flourishing. I am a Type A analytical person who lets my research do the talking. With Periscope, I had to speak to people on a consistent basis. Livestream has helped me communicate with people whom I do not know. I made over $7500 when I ran my eBay store. No lie, whenever I would broadcast at 7:30pm EST, I would receive another sale and/or inquiry by morning. I learned how powerful livestream was towards my business. It also allowed me to apply my MBA in marketing skills. Marketing contains the 4Ps : product, place, promotion and price. With Periscope, I was able to capture all of that during my eBay broadcasts. This resulted in my receiving over $7500 in sales. Furthermore, I also received same day PayPal money availability because I was so good at running my eBay store. I had NO video production skills when I first went live on Periscope in July 2015. For the first couple years, I was literally in the dark just broadcasting from my apartment. Of course, when you know better, you do better so I got a ring light, broadcast during daylight hours, and learned more about camera angles. Today I am shooting my own work video series using the skills that I have acquired from Periscope. I am a Perigirls member. Perigirls is the largest female online Periscope community. I am a member of the Heart Tribes, the exclusive group, where we broadcast daily and do other activities. Without Periscope, there would be no Perigirls. 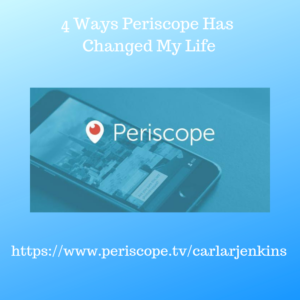 Periscope has been a very big and positive impact upon my life. Here’s to the first four years and the next four!